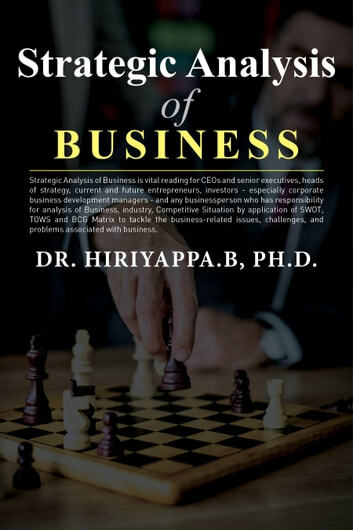 Strategic Analysis of Business is vital reading for CEOs and senior executives, heads of strategy, current and future entrepreneurs, investors - especially corporate business development managers - and any businessperson who has responsibility for analysis of Business, industry, Competitive Situation by application of SWOT, TOWS and BCG Matrix to tackle the business-related issues, challenges, and problems associated with business. 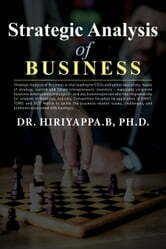 This book is specially designed for those who are the students of Business, MBA, PGDM & Executives. IT management, businessmen, entrepreneurs, operating managers, middle-level managers across the management consultant, business executives and business professionals such as director of forecasting and planning, forecast manager, director of strategic planning, director of marketing, sales manager, advertising manager, CFO, financial officer, controller, treasurer, financial analyst, production manager, brand/product manager, new product manager, supply chain manager, logistics manager, material management manager, purchasing agent, scheduling manager, and director of information systems.